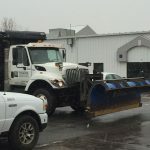 Terracare Associates-TCA offers full service snow removal service and ice management operations that are reliable, experienced and quickly mobilized for any size storm. “Today’s forecast calls for heavy snow” you hear on the news. A trusted snow removal service is the key to a peaceful, relaxed winter. Regardless of the size of your roads or property, TCA offers a tailored snow removal plan for commercial properties, HOA’s, municipalities, highways and institutions. We develop accumulation rate maps and tailor plans for parking lots, roadways and sidewalks to safely manage snow and ice in an environmentally sound way that minimizes damage to your landscape. We are committed to providing the best experience to our clients and offer all the latest storm management technology to ensure maximum efficiency, safety and reliability. 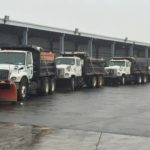 We seek a proactive approach to storm management and snow removal and we pride ourselves in the management of each weather-related event and take your safety needs very seriously. Our staff has decades of experience and the breadth of knowledge and resources needed to accommodate even the toughest of storms – keeping the public safe and healthy.